Safety Rating: UL Listed. Rated for Dry locations. Capital Lighting is a family-owned company located just outside Atlanta, Georgia. We pride ourselves on delivering stylish, high-quality products at affordable prices through the best lighting showrooms across the United States and Canada. As you browse our site, you will discover why Capital Lighting has earned a reputation for creating well-designed fixtures. Beginning with design concepts from popular home fashions, we transform our ideas into lighting fixtures that blend timeless beauty with today's styling. As our designs take shape, we make sure that a high standard of quality goes into manufacturing each fixture. From the casting and forging to the hand-painted finishes and fine details, we strive to make our products the best in the industry. Our 2009 offering includes several new fixture collections in both traditional and transitional styling, fresh new faux finishes with rich details, great new mirror styles and our new collection of Energy Star fixtures for inside and outside your home. You will also find all the Capital classics and our ever-popular best sellers. The Capital Lighting family of associates and showrooms works hard to deliver high-quality stylish products backed by superior service. We are confident you will be pleased with your Capital Lighting experience. Q What is the shade made of? Metal or fabric? 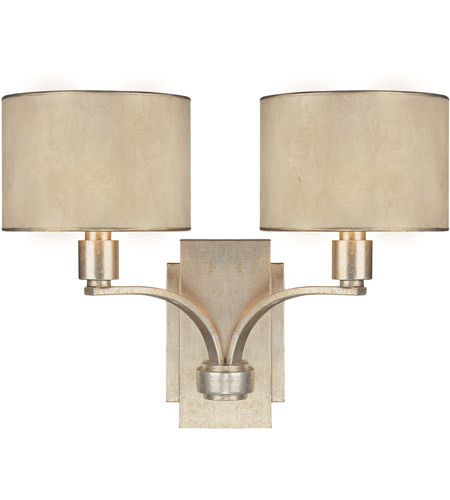 A The shade on the Capital Lighting 1027WG-410 Luna 2 Light 17 inch Winter Gold Sconce Wall Light is made out of a mics fabic which is a thin sheer material and is attached to a hard back shade.